Please note that the total maximum capacity of the complex is 250. This may be increased by arrangement, by erecting a marquee and portaloos outside. 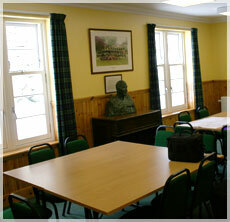 The equipment available on-site (data projector, screen, laptop, DVD/video) are suitable for use in the Upper Hall, Committee Room and for small meetings in the Main Hall. Higher resolution projection equipment and audio/PA is recommended for larger meetings in the Main Hall and can easily be hired in.